Just taking the tour is a bucket list event for me. I’d love to take one with Mr. Kauffman! I have to agree, his work is among the absolute best when it comes to Booth and the assassination. Have fun! Wish I lived closer! Great to meet you last week on the Escape Tour! I agree-Michael Kauffman’s book is excellent! I had read Mr Kauffmans’ Book an took the tour. It was amazing so informative and wonderful. f you can’t take the tour get the book a great read for sure. 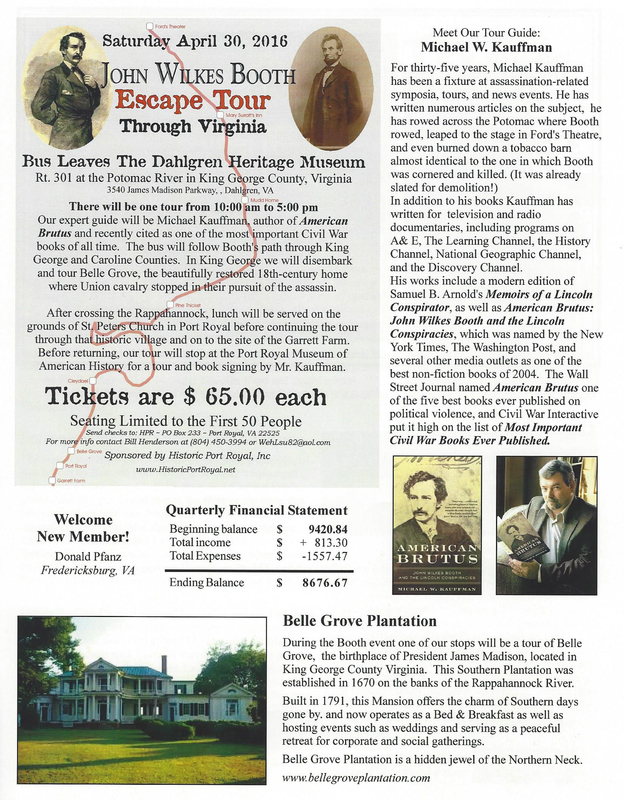 For those who would like to do the FULL Booth Escape Route Tour (that began in 1977 with the late James O. Hall, the dean of Lincoln assassination studies) and the Surratt Society and Museum, there will be three bus tours going over the route this fall. Visit surrattmuseum.org for more details We begin booking in mid-June, and it helps to get on our magic mailing list to receive advanced information before we open it in general. The cost for these complete tours is $85/person. The only thing not covered in that cost is your mid-day meal. We take you to a restaurant, but you choose your selection and pay for it. Our tours are also run three times in the spring. We highly enjoyed the tour last weekend Laurie! Glad we made the trip from Fargo!